I learned a valuable lesson when I first attempted to bake macarons. They were either flat and useless or big and cracked! Well, that’s what you’re going to discover here. You’ll also learn how to add colour and different flavours to make several variations. Macarons are best eaten on the day but will store in a dry air tight container for 3 or 4 days. Chances are though, they will not last that long as they are extremely tasty! Other people will want to sneak them out and eat them – just saying. There are several steps to concentrate on in order to making the perfect macaron. What’s the difference between Macaron and Macaroon? The French macaron is a sandwich of flavouring between two almond based meringues. They are light, crunchy and oozing with flavour. The macaroon on the other hand is a sweet bake of shredded coconut usually made with condensed milk. An altogether different type of cake but still very nice. This recipe started life in the brilliant book by William Curley, ‘Nostalgic Delights’, but I have changed it slightly to suit my needs and to create more macaron flavours. If you need to scale up or down your recipe please see my easy recipe converter for help. This is where you mix most of the dry ingredients into a thick paste and add your colourings and flavours. How you mix your egg whites can be make or break this recipe. I find the more stable meringue mix to be the Italian method where you heat the sugar first and mix this into the egg whites gradually. Now is the time to bring together all your previous work. By mixing the meringue into the paste with a rapid and pressing folding motion helps knock out the air giving you the right consistency of mix, which will be crucial when it comes to piping successful macarons. Use a piping bag with a plain wide nozzle and pipe onto a baking tray lined with parchment paper or better still a baking mat or silicon macaron mould. Whichever you use, start close to the mat and stay central. Squeeze out just enough mixture and allow it to spread gently to the right size – usually 3 to 5cm in diameter. You can draw circles on your mat to help guide you but after a while you will learn how much to pipe. Knowing your oven is crucial here. Baking at the correct temperature for a specific amount of time will give you a rise in your meringue without it spreading out. It will also help you create the foot at the base of the macaron. Practice makes perfect, so you may wish to experiment with a small tray of piped macarons first before baking the full amount. It took me several attempts before I could rely on my oven temperatures to bake them perfectly. Make a flavoured butter icing or ganache filling and/or decorating the shells by adding chopped nuts or a brush of chocolate. Adding a sprinkling of chopped nuts before the bake will add another level of taste to your macarons. Experiment and be brave! When I first tried this recipe the macarons were a COMPLETE DISASTER. They were either wafer thin and a floppy mess on the baking tray or big, hollow and cracked! It was my fault entirely and nothing to do with the recipe. Well, there were two reasons actually. I was not patient enough to whisk the egg whites correctly. I didn’t know how to use my oven correctly. By using the Boil & Whisk Technique I quickly corrected my first few disasters. What is The Boil & Whisk Technique? This technique is also known as the Italian meringue method. It makes a more stable meringue, making it easier to work with. In a saucepan boil the sugar with a little water till you get a liquid and keep boiling until the temperature reaches 117 degrees centigrade. Now start whisking your egg whites to a very soft peak. When your sugar syrup reaches 120 degrees centigrade gradually add it to the egg whites as you whip them to form a stiff peak. The hot sugar helps to bake the egg whites whilst you are whipping them and makes the meringue easier and more stable to work with. I quickly discovered how my oven works when I baked cheesecake for the first time and it didn’t look too good. You have to learn how quickly it bakes and which shelf is best to use as overbaking macarons will make them dry, bitter and discoloured. What Food Colourings Should You Use? Try to use either dry powder colourings or gel based natural food colourings if possible as they do not add too much moisture to your ingredients. Sometimes water based food colourings can make your paste far too wet and this affects the overall structure and bake of your finished macaron. Personally I am not a great fan of brightly coloured macarons – yes they look good when packaged and gifted but I prefer more natural colours and flavours. Let your taste buds decide! Believe me, once you’ve learned how to make macarons you will want to scale up this recipe to make more! In which case you need to try my recipe converter by clicking here. We are going to start by baking a basic macaron recipe that you can add to with flavourings and food dyes. Pre heat a fan oven to 150 degrees centigrade, non-fan oven to 170 degrees centigrade. Line 2 baking trays with parchment paper and draw 3cm circles over the paper to help guide you when it comes to piping the macaron mixture. They should be approximately 1cm apart as the macaron mixture will not spread whilst baking. The ground almonds can be shop bought but you can also chop your own in a food processor then sieve to remove the larger nuts. This recipe you will make between 30 and 50 macarons shells, depending on your piped size. Put half the egg whites into a mixing bowl along with the ground almonds and icing sugar then beat to a paste with a wooden spoon. (This is where you would add any flavourings or colours). In a saucepan heat the sugar and water until it reaches 117 degrees centigrade and turns to liquid. Put the remaining egg whites into a bowl and start to whisk on a medium speed. Take the saucepan off the heat when it reaches 120 degrees centigrade and gradually add to the to egg whites whilst you continue to whisk them. Do not rush this stage as it will cause lumps in your meringues. Keep whisking until you reach stiff white peaks. Using a wooden spoon fold the meringue into the paste until thoroughly combined. Continue mixing with a spatula. The consistency should be thick enough to drop off the spatula as you lift it out of the bowl but not too runny. If it’s too thick it will drop off the spatula in clumps. Keep mixing until it becomes smoother. Spoon into a piping bag with a 1cm plain nozzle and pipe onto the baking trays by pointing the nozzle at the centre of the drawn circle and simple squeezing enough mix out till the circle is covered. Bang the baking tray on the worktop a few times to release any air bubbles. You can pierce any remaining air bubbles with a sharp knife and then smooth over the macaron shell. Remove from the oven and leave to dry completely before moving each one onto a wire cooling tray. All this may sound a lot to do but, believe me, it really is worth it. Just put some music on in the background and enjoy the baking process. When your macarons have dried out you are then ready to make the butter icing or ganache filling. Do not be tempted to over fill with icing as they could become far too sweet. Spoon into a piping bag and pipe onto the base of a macaron shell. Place another shell on top and there is your finished macaron. These need no other colourings to be added as the cocoa powder does all the work for you. Add 30g of cocoa powder to the macaron paste in step one, and add an extra 15g of cocoa powder to the butter icing filling. If you love this flavour, try making my easy brownie recipe with cocoa powder. Make as above but reduce the cocoa powder to 15g. For the macarons, reduce the 140g of ground almonds to 120g and add 20g of ground pistachio nuts. Add a dash of green food colouring. Once pipped onto your baking tray sprinkle some chopped pistachio nuts over the top of each macaron. For the filling add 20g of finely chopped pistachio nuts. As above but add 15g of instant coffee granules dissolved in a teaspoon of boiling water and add to the almond, icing sugar and egg white paste. Do the same for the butter icing filling. Be careful not to make the paste too fluid, so monitor how much water you add. Add and extra 10g of ground almonds, caster sugar and icing sugar to the macaron mix, plus a teaspoon of pure vanilla extract. With the filling add 1/2 tsp of vanilla extract. For extra macaron flavours check out this site. 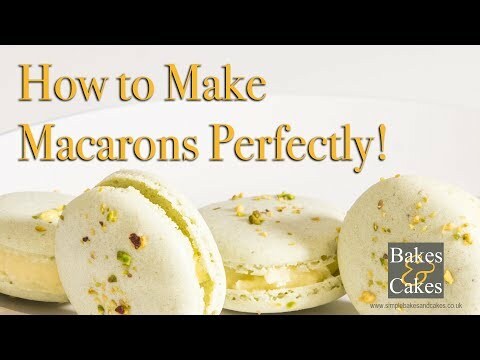 If you have enjoyed this guide on how to make macarons please leave a comment below or SHARE it on Facebook. Your help is much appreciated.